China’s focus in Afghanistan is moving away from development projects and towards the containment of perceived security threats. 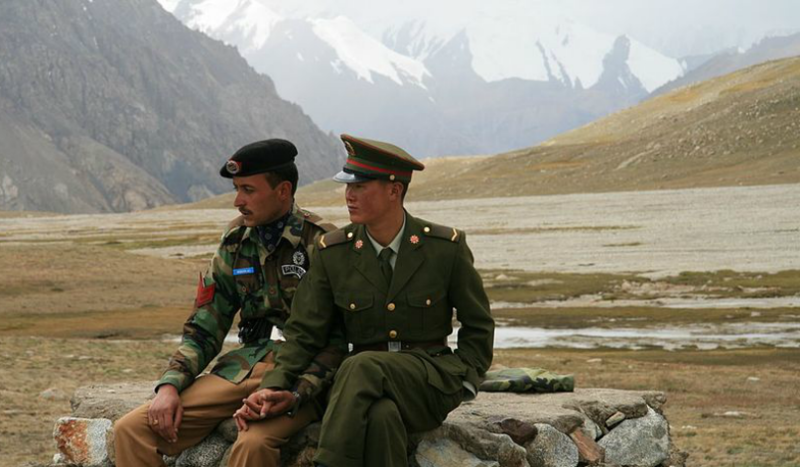 Europeans do not yet fully understand China’s new approach, seen in its patrols of the Wakhan Corridor – in what it calls a “joint counter-terrorism operations” with Kabul – and other security initiatives involving Afghanistan. To develop realistic expectations of China’s contribution to international development and security, Europeans need to understand how the country’s priorities are shifting from development to security in countries such as Afghanistan. Building on this understanding, European states that already cooperate with China in third countries should identify further areas of common interest – with a view to deepening Sino-European cooperation. Equally, European countries and the European Union should question China’s rhetoric – not least its claims within the framework of the Belt and Road Initiative – and insist that it live up to its commitments. In early 2017, reports began to circulate in the international media that China’s security forces were patrolling the Wakhan Corridor, a tiny strip of Afghanistan bordering the Chinese province of Xinjiang. Although Beijing would only confirm that it was undertaking “joint counter-terrorism operations” with Kabul, the patrols are actually indicative of a broader shift in Chinese policy in the region. After years of heavily promoting its vast Belt and Road Initiative (BRI) as purely about development, China now seems to view security engagement as its primary concern. Beijing’s narrative on the BRI focuses almost exclusively on promoting the project as a big, nearly global assistance package, aiming to boost China’s image as a reliable partner for development. To this end, China announced in March 2018 the establishment of the National Development and Cooperation Agency. The organisation will oversee foreign aid, operating separately from both the Ministry of Commerce and the Ministry of Foreign Affairs. However, China’s activities in Afghanistan show how little it has done to justify the BRI narrative in these areas. Beijing’s most substantive engagement with Kabul has been in border control measures designed to prevent terrorists from entering China, especially Xinjiang. A similar pattern has emerged in central Asia: China is working to deepen its cooperation with countries in the region by largely concentrating on measures to combat terrorist groups and other threats. Although Beijing rarely speaks about expanding its security ties with other countries, these trends indicate that it could be developing a capacity to promote stability in the region. Meanwhile, there has been no commensurate increase in Beijing’s development initiatives in Afghanistan. Although Afghanistan could be a central hub for the Silk Road Economic Belt (the BRI’s land component) linking central Asia with south Asia, Beijing has avoided large-scale infrastructure projects there – likely fearing that growing security threats and governments’ financial weakness will make for a poor return on investment. Therefore, despite many Europeans’ hopes to the contrary, China does not appear to be using its growing economic power to become a provider of public goods. As Beijing’s engagements within Afghanistan show, the BRI is no Marshall Plan. And, if its interactions with Kabul are consistent with true BRI policy, Beijing will be equally reluctant to engage in substantive, long-term development projects elsewhere in the world. Nonetheless, European states may be able to capitalise on the shift in China’s approach away from development and towards security – if they can understand why it has occurred. Understanding China’s shift would enable Europeans to focus on the right areas to cooperate with Beijing while at the same time to question China’s engagement in other areas. This report examines the evolution of Beijing’s engagement with Afghanistan, assesses what it means for China’s overall approach to the BRI, and explores ways in which European Union-China cooperation could promote stability and prosperity in countries in crisis. Afghanistan’s long, bloody conflict and chronic corruption problems have defeated many stabilisation and development initiatives in the past two decades. Having watched these often Western-led projects fail, Beijing now views the country as increasingly important, if not yet a strategic priority. This is due to both the security threats emanating from Afghanistan and its proximity to Xinjiang, where tension between the Han majority and the Muslim Uighur minority has in recent years led to several waves of violence. Blaming the unrest on Islamist militants, Beijing has introduced a range of new security measures to further tighten its control over Uighurs – an effort that has only provoked more resistance and violence. The Chinese government perceives terrorist groups – particularly the East Turkestan Islamic Movement (ETIM), which seeks independence for Xinjiang – as the most significant threat to its national security. Afghanistan’s overall security situation has deteriorated since 2015, following the formal withdrawal of NATO combat troops from the country at the end of the previous year. The Taliban has extended its influence and, to some extent, its territorial control in Afghanistan, while Afghan government forces have increasingly struggled with a lack of funding and personnel. The group has also intensified its mass-casualty attacks in large urban areas, targeting the Afghan government and foreign military facilities there. Originally scheduled for July 2015, Afghanistan’s parliamentary election has again been pushed back, from July to October 2018. The contest will indicate how Afghans are likely to vote in the mid-2019 presidential election. But the frequent attacks across the country and the weakness of its governance structures point to a bleak future. China moderately increased its engagement with Afghanistan after the NATO withdrawal. However, a significant shift in Beijing’s stance on security issues in Afghanistan only came after the Islamic State group (ISIS) established its Khorasan Province offshoot in the country. Estimates of the number of ISIS fighters in Afghanistan range from 5,000 to less than 1,000. Although the lower estimate (from NATO’s Operation Resolute Support) is likely correct, the ISIS presence in Afghanistan has prompted a major change in Chinese policy. Terrorist groups have long indirectly threatened Chinese nationals living in Pakistan and other countries. But Chinese leaders were shaken when ISIS issued its first direct threat against China in February 2018, releasing a video in which Chinese Uighurs vowed to return home to carry out attacks. Beijing perceives ISIS as much more of a threat than the Taliban, as the former acts globally while the latter confines its activities to Afghanistan. The Chinese government fears that ISIS has gained a foothold in Afghanistan’s Badakhshan province, on China’s border, and believes that the group is persuading a growing number of ETIM supporters to gather there. For Beijing, these developments have parallels with events in the late 1990s, when an Islamist Afghan government supported the Uighur separatist movement in Xinjiang. The United States also believes that there are Uighur militants in Badakhshan province, targeting them with airstrikes in February 2018. However, the Afghan Analyst Network suspects that there are only a small number of Uighur extremists in Badakhshan, and that they do not pose a cross-border threat. At an ECFR policy conference in March, Chinese scholars largely agreed that it was unlikely that these militants could directly infiltrate Xinjiang from Badakhshan, as to do so they would have to cross difficult terrain. Thus, Beijing’s main concern is that terrorist violence in Afghanistan will spill over not into Xinjiang but into either Pakistan – perhaps endangering the China-Pakistan Economic Corridor (CPEC), its flagship BRI project in Pakistan – or central Asia. This is partly because, in recent years, ISIS has claimed responsibility for an increasing number of terrorist attacks in Pakistan, India, and Bangladesh. An estimated 2,000-4,000 people from central Asian countries have joined ISIS, aiding the network’s efforts to commit terrorist attacks across the globe. For instance, an ethnic Uzbek carried out a truck attack in New York in the group’s name in October 2017. An assault on the Chinese embassy in Bishkek, Kyrgyzstan’s capital, in August 2016 reminded China of militants’ reach in central Asia. The attackers were allegedly Uighurs with ties to fighters in Syria. China is also concerned about other threats emanating from Afghanistan, particularly cross-border drug trafficking. 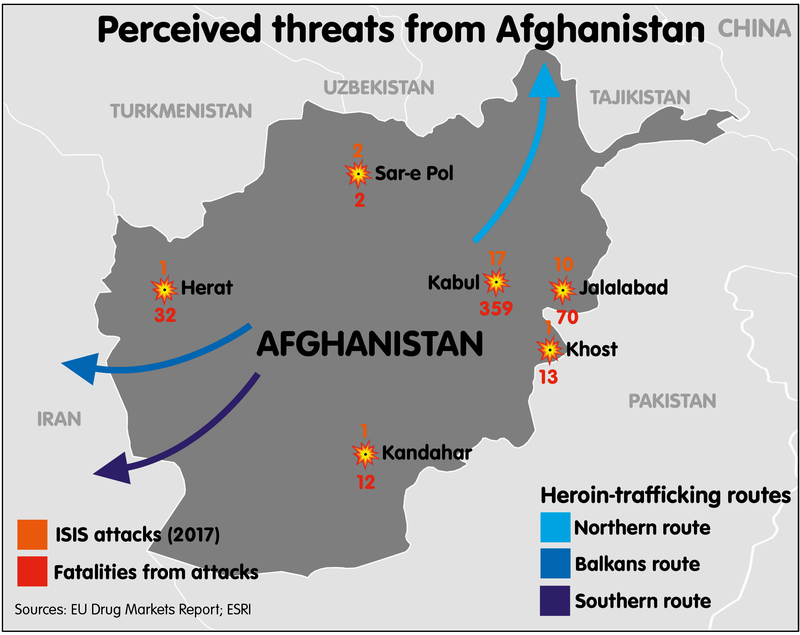 Afghanistan accounts for roughly 80 percent of global opium production, while the states of central Asia contain major transit routes for narcotics produced in the country. Afghan opium production appears to have surged since 2016, partly due to the use of a new genetically modified poppy seed originating in China, where some opium is farmed legally for pharmaceutical purposes (China is one of the world’s largest opiate consumers). The drug trade closely relates to the Taliban’s insurgency, as it is a traditional source of income for the group. Some EU member states have encouraged China to become more engaged with global development issues, including those in Afghanistan. Germany decided in March 2018 to further expand its military presence in Afghanistan. Norway, the United Kingdom, and the EU also remain committed to Afghanistan’s security and development. Germany and China initiated in 2016 a programme to train Afghans in the mining sector – Berlin’s and Beijing’s first cooperative effort of this kind in a third country (the German agency for sustainable development has helped implement the programme). The UK began a similar initiative with China, focusing on infrastructure development in Afghanistan, in 2017. Such projects may reflect expectations that China will increasingly contribute to global development and security challenges. Germany has encouraged China to engage with developing countries in other regions as well. For example, the two sides have entered into an agreement to build a hydropower plant in Angola. And Berlin has expressed hope of expanding such cooperation with Beijing in other parts of Africa. Similarly, the UK and China have for several years cooperated on trade and development issues on the continent. The assumption behind these undertakings is that, as China’s economic, political, and military rise allows it to expand its global reach, the country will make a greater contribution to global development. However, security and development cooperation between European countries and China in Afghanistan is in its early stages – and, as such, has achieved little so far. Indeed, this cooperation has fallen short of Europeans’ expectations. There is no guarantee that China will increase its contribution to global development and security challenges: events on the ground in Afghanistan indicate that Beijing is reluctant to deepen its cooperation with Europeans on development issues. In its report to the 19th Party Congress – held in October 2017 – the Communist Party of China (CPC) put forward an ambitious road map that included the first official mention of Beijing’s ambitions of global leadership. The report states that China will “become a global leader in terms of composite national strength and international influence”. This confirmed a trend China-watchers have observed since Xi Jinping’s ascent to the presidency in 2013: China increasingly seeks to become a global power, as reflected in its growing economic and diplomatic engagement with countries around the world through, for instance, UN peacekeeping missions and contributions to the UN World Food Programme. Beijing has also started to offer a “Chinese solution” – a term Xi first used in October 2016 – to global challenges. The implication behind this offer is that China is better placed to resolve regional and global problems than other countries, particularly the US. Beijing’s apparent solutions to shortfalls in global infrastructure, economic development, and cultural ties are manifest in the BRI. Following the 19th Party Congress, Foreign Minister Wang Yi elaborated on the CPC’s approach to global leadership, stating that “China will actively explore a way of resolving hotspot issues with Chinese characteristics and play a bigger and more constructive role in upholding world stability.” This implies that the country will become proactive in regions in crisis, perhaps intensifying its efforts there due to the growing number of Chinese workers and investments abroad. Indeed, Beijing has already started to focus on protecting foreign-based Chinese nationals. In short, regional and global security threats are increasingly relevant to China’s changing international posture, while the CPC’s first steps into the next five-year plan indicate that it is enhancing its traditionally low profile on security matters. As announced during the 19th Party Congress, these steps begin a “new era” in China’s development, one in which the country will become, as Xi put it, “a mighty force” and a “global leader” by 2050. In this new era, China will, among other things, accelerate the modernisation of the People’s Liberation Army (PLA) with the aim of transforming it into a top-tier military by mid-century. The country will also develop a more assertive foreign policy – with the BRI the leading initiative in this, having been formalised in the CPC’s constitution. Beijing has promised that countries committed to the project will gain greater benefit from Chinese trade, investment, and financing; as Xi stated, China is placing “equal emphasis on ‘bringing in’ and ‘going global’”. Yet Beijing engages with Afghanistan in only a limited fashion. It is most active in the country on security issues – informally, in the Wakhan Corridor; formally, within bilateral and multilateral frameworks. China, Afghanistan, Pakistan, and Tajikistan launched in August 2016 a counter-terrorism cooperation initiative that initially focused on border control and has since developed to include other activities. The countries announced in April 2018 that they would carry out a joint counter-terrorism exercise and engage in training in realistic combat. This is the only such cooperation initiative in which the PLA acts as China’s representative – a reflection of Beijing’s growing anxiety about security threats originating in south and central Asia. Tajikistan is a particular concern for the Chinese government, because the country’s border with Afghanistan is 1,300km long and runs mainly through mountainous areas – making it relatively difficult to enforce. Despite Russian support for Tajikistan forces stationed there, the border remains porous. As a consequence, the Chinese government has become increasingly concerned about narcotics and Islamist insurgents crossing the border en route to Xinjiang. Beijing agreed in September 2016 to finance and build several outposts for Tajikistan border guards, along with other facilities, along the Afghanistan-Tajikistan border. In September 2017, China and Tajikistan agreed on an intelligence sharing arrangement as part of an effort to upgrade their relationship to a “comprehensive strategic partnership”. This intelligence sharing focuses on terrorism, separatism, and religious extremism, as well as drug trafficking. The sides have also committed to improving communications between their defence and security services. Beijing’s unusually intense interest in engaging with Tajikistan reflects its concern about the emergence of ISIS as a direct threat to China, and the boost to the Uighur separatist movement the group might provide. Regarding cross-border terrorism as a real threat, the Chinese government is determined to prevent ISIS from gaining a foothold in Afghanistan and central Asia. In March 2016, as part of the effort to strengthen its security relationship with Afghanistan, China dispatched Fang Fenghui, then head of the military, to Kabul. During the visit, Fang pledged around $70m in military aid to the Afghan government’s counter-terrorism initiatives. In December 2017, senior Chinese and Afghan military officials agreed to further increase their cooperation on counter-terrorism and other security issues, including border control. According to Chinese scholars who attended an ECFR conference held in Beijing in March 2018, the resulting border security measures related not to the Wakhan Corridor but to other parts of Badakhshan. In January 2018, the Chinese embassy in Kabul announced that China would provide further military aid to Afghanistan to help build up the Afghan army’s capacity. China has also used the Shanghai Cooperation Organisation (SCO), in which Afghanistan has observer status, to draw attention to regional security issues, particularly those in Afghanistan. On 28 May 2018, China hosted an SCO-Afghanistan Contact Group Meeting, part of an initiative launched in 2005 to draft recommendations on cooperation between the parties. Involving SCO and Afghan deputy foreign ministers, the meeting was the second to take place following the group’s 2011-2016 period of inactivity. Beijing appears intent on raising the profile of the SCO-Afghanistan Contact Group, having emphasised during the meeting that each SCO member should give the undertaking its full attention. During the 18th SCO summit, held in China on 10 June 2018, Xi called on the organisation’s members to focus on the contact group as a mechanism for facilitating peace and reconstruction in Afghanistan. He also committed China to training a total of 2,000 law-enforcement officers across other SCO countries during the next three years through the China National Institute for SCO International Exchange and Judicial Cooperation, declaring his intent to enhance law enforcement capacity building. Moreover, at a meeting with Afghan President Ashraf Ghani on the sidelines of the summit, he called for enhanced counter-terrorism and security cooperation between their countries. However, China’s push for increased SCO-Afghanistan engagement has had only limited results – partly due to member countries’ differing perceptions of the US presence in Afghanistan, and partly due to their disagreements on how best to deal with the Taliban. For example, China believes it necessary to maintain military pressure on the Taliban, while Russia appears to favour a relatively soft approach to the group, hoping that it will fight ISIS in the region. Although Beijing rejects the idea of supporting the Taliban, it believes that reconciliation is the best course in Afghanistan and that the group is part of Afghan society. Some Chinese scholars see the Taliban as increasingly moderate and would therefore welcome the group taking on a political role – even to the point of joining a future government. A few go so far as to hope, like Russia, that the Taliban will defeat ISIS on Afghan soil. However, China does not want the Taliban to take power by force. Regarding ISIS as a common enemy of both the Afghan government and the Taliban, Beijing has started to warm to the idea of including the group in the Afghan government. China has also attempted to use diplomacy to improve security in Afghanistan, focusing mainly on peacemaking and mediation with the Taliban rather than development. Actively working to create an Afghan peace process, Beijing has since early 2016 engaged in talks in Islamabad with Afghanistan, Pakistan, and the US as part of the Quadrilateral Coordination Group (QCG). The QCG aims to initiate talks with the Taliban to restore peace in Afghanistan. However, the process has been stalled since May 2016, when a drone strike killed Taliban leader Mullah Akhtar Mansour. On 17 October 2017, the QCG gathered again in Muscat to attempt to rejuvenate the talks. During the March 2018 ECFR conference, Chinese scholars expressed scepticism about the progress the QCG had made, particularly since US President Donald Trump came to power. They pointed out that he has exacerbated tension in the US-Pakistan relationship, having lashed out at Pakistan for its alleged “lies and deceit”. China therefore appears committed to diversifying its Afghan peacemaking efforts beyond the QCG. This involves engaging in other dialogue formats, such as trilateral vice-ministerial consultations with Afghanistan and Pakistan, which focus on counter-terrorism and other security issues. In November 2017, this group held a consultation on a trilateral memorandum of understanding on counter-terrorism cooperation. In December 2017, Beijing hosted the first China-Afghanistan-Pakistan Foreign Ministers’ Dialogue. Moscow too has shown a renewed interest in Afghanistan – an interest seemingly triggered by the emergence of ISIS there. (Moscow may also view Washington’s struggle to maintain security in Afghanistan following the NATO withdrawal as an opportunity to compete for influence in the country.) Russia launched on 14 April 2017 a regional meeting format involving Afghanistan, China, India, Iran, Kazakhstan, Kyrgyzstan, Pakistan, Russia, Tajikistan, Turkmenistan, and Uzbekistan. This “Moscow format” aims to explore the prospects for peace in Afghanistan, appealing to the Taliban to abandon the use of force and to resolve the conflict by engaging in direct dialogue with Kabul. There was limited progress on the peace talks issue during the second meeting of the Afghan-led Kabul Process for Peace and Development, on 28 February 2018. Ghani offered the Taliban unconditional peace talks and the possibility of political recognition. This was the first time the government in Kabul had made such an offer. However, the Taliban has not officially agreed to sit at the negotiating table; many observers assume that persuading it to do so will require greater pressure on the group from its alleged ally, Islamabad. The US and many European countries believe that only Beijing can persuade Islamabad to apply this pressure. Yet China remains reluctant to interfere in what it sees as Pakistan’s internal affairs, repeating Islamabad’s argument that Pakistani actors are not necessarily able to control the Taliban. In addition, China believes that the US and others overestimate Chinese influence on Pakistan. And China recognises that, although it has leverage over Pakistan through CPEC investment, it needs to be cautious about using this leverage. In stark contrast to the Trump administration, Chinese leaders seem to believe that pressuring Pakistan would be counterproductive. China has evolved into a notable player in Afghanistan in the areas of economic and humanitarian assistance. Beijing provided roughly $240m in development assistance and aid to Afghanistan between 2001 and 2013, and around $80m in 2014 alone. In May 2016, the countries signed an agreement on technical cooperation (worth around $76m) and a deal on non-emergency humanitarian aid. Since 2015, Beijing has trained more than 2,300 Afghan professionals in various fields, and granted scholarships to more than 150 Afghan students. However, China’s overall contributions since 2001 are small compared to those from other donors; for instance, in 2015-16 alone, Norway contributed around $84m, the UK around $405m, Germany around $432m, and EU institutions around $296m. Afghan-Chinese trade has developed rapidly since becoming duty free in 2015. According to Chinese sources, in 2016, this change affected around 97 percent of Afghan exports to China, while the countries engaged in bilateral trade worth almost $1 billion. China is now Afghanistan’s third-largest trading partner, surpassing the EU. China also claims to be the largest source of investment in Afghanistan, pointing to a $3 billion lease of the Aynak copper mine by a consortium of Chinese state-owned companies, announced in 2008, and investments by the China National Petroleum Corporation there, which include interests in oilfield exploration. However, these projects have so far failed due to security issues and disagreements over their terms. As a result, China has refrained from further large-scale investments in Afghanistan. In infrastructure development, China instead focuses on relatively small projects such as housebuilding. Although Beijing and Kabul signed a memorandum of understanding on BRI cooperation in 2016, this has led to the implementation of few projects. Direct flights between Kabul and Urumqi, Xinjiang’s capital, resumed in July 2016, while the first cargo train journey from China’s Nantong to Afghanistan’s Hairatan took place in September that year. During the BRI forum held in May 2017, Beijing and Kabul signed a memorandum of understanding on information technology and telecommunications cooperation, paving the way for a cross-border fibre-optic project (which the World Bank will fund). China announced in December 2017 that it would be willing to extend CPEC to Afghanistan. However, Beijing has not specified what this means in detail, nor who will pay for it. The initiative could include only small-scale projects – for instance, as some Chinese scholars have suggested, a joint industrial park. However, to help ensure their security, these projects would have to be undertaken close to Pakistan’s CPEC infrastructure, which the Pakistani army protects with up to 30,000 security personnel. But Islamabad allegedly opposes the idea of linking its prestigious CPEC project with Afghanistan. Given these considerations, the CPEC Afghanistan idea may never be implemented. While China has increased its development assistance to Afghanistan in recent years, this aid has done little to change the situation on the ground. Beijing regards the development of Afghanistan’s economy as important to ending the country’s conflict, as this would help to address the social causes of insurgency in the long run. Despite promoting Afghan-Chinese trade, Beijing is unlikely to prioritise investment in Afghanistan in the short term due to the instability the conflict creates. Overall, the Chinese government seems unwilling to play a lead role in Afghanistan, so will likely focus its Afghan policy on China’s practical needs there. Beijing traditionally prefers to tackle security issues in multilateral settings such as the SCO – partly because it is reluctant to take on the whole burden of addressing security challenges, and partly because greater bilateral engagement might contradict its principle of non-interference in other states’ internal affairs. However, this seems to be changing in the case of Afghanistan, presumably because multilateral efforts have failed to improve security. Alongside mechanisms such as the QCG, China has engaged with Afghanistan and Tajikistan bilaterally. China’s endgame appears to be not a decisive peacemaking effort but the containment of threats to its interests. In Afghanistan, Beijing seems to have adopted a transactional, flexible approach rather than a grand strategy that aligns with its BRI rhetoric. As a consequence, for Europeans, China’s behaviour in Afghanistan hints at the meaning behind its stated aim of “resolving hotspot issues with Chinese characteristics”. In practice, the “Chinese characteristics” label is open to interpretation, allowing room for manoeuvre as China engages with other countries when and where this serves its interests. Beijing can pick and choose whether to free ride on other states’ efforts in Afghanistan or else become more active there. As a result, Europeans who hoped that China would become a key stakeholder in Afghanistan and elsewhere – and would engage with crisis regions in proportion to its global ambitions – are likely to be disappointed. Equally, Europeans should not see the BRI as a solution to development or economic challenges. Some recipients of Chinese BRI investment have started to question its benefits for their country. 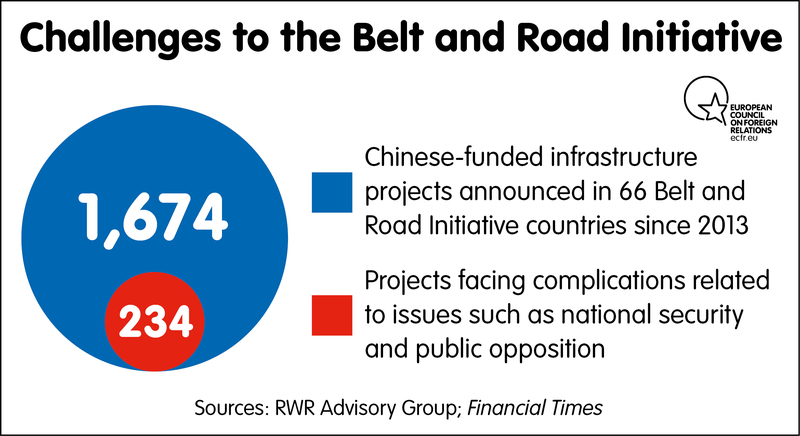 China’s infrastructure investment often entails loans rather than aid, raising the threat of a debt crisis that could force the debtor to hand key ­assets to China. For example, after becoming unable to pay back debts of more than $8 billion, Sri Lanka agreed during negotiations with Beijing in December 2017 to lease its deep-sea port at Hambantota to China for 99 years. The port provides access to critical Indian Ocean sea lines of communication. Contrary to China’s BRI narrative on mutually beneficial deals, the arrangement appears to have had only downsides for Sri Lanka: despite handing over a strategically important port, Sri Lanka owes even more debt to China this year ($13 billion) due to the high interest rates on its existing loans. According to the Center for Global Development, 23 of 68 potential BRI borrowers face the risk of debt problems. Eight of them – including Djibouti, the Maldives, Pakistan, and Tajikistan – will find themselves vulnerable to unusually high levels of debt. China’s and the EU’s policies on Afghanistan reflect their differing views on development and security crises. For instance, despite their shared interests in countering terrorism and narcotics trafficking, they have pursued distinct responses to these challenges in Afghanistan. EU institutions focus on civilian security assistance, stability, state building, police reform, and substantive development assistance. They place less emphasis on securing Afghanistan’s borders. In contrast to China, the EU does not regard ISIS as the most significant security threat in Afghanistan. Nor does the EU participate in all dialogue formats involving China – although it supports these initiatives, particularly the Kabul Process. From a European standpoint, there is a risk that these formats will compete with and contradict one another. The EU’s support for the Kabul Process, which began in June 2017, stems from the fact that it aims to aggregate the work of other dialogue formats. Because of these differing views and approaches, it is difficult to find substantive Afghan projects on which the EU and China can cooperate. However, by understanding China’s priorities, Europeans have a chance to focus on areas in which their efforts could converge. Although it is most engaged in border control, China also has an interest in the related issue of non-traditional security threats such as drug trafficking and unmanaged migration. It is on these issues that there may be a way for European countries to engage with China in Afghanistan. Substantive, practical joint projects in Afghanistan could inform similar EU-China initiatives in other regions. Drug trafficking is one issue on which the sides should deepen their dialogue, perhaps with the assistance of EU embassies in the region. They could develop this effort through the establishment of cooperation mechanisms for their envoys to central Asia and Afghanistan. More broadly, the EU Drugs Strategy 2013-2020 provides for regular expert dialogues on drug issues with Latin America, central Asia, the Eastern Partnership, Russia, the US, and western Balkans countries. The EU could extend these dialogues to China. With the poppy cultivation at the centre of Afghanistan’s narcotics networks booming, there is a need to find alternative sources of livelihood for Afghan farmers. Recognising this, China has started to pay more attention to agriculture in Afghanistan. More than 80 percent of Afghans rely on agriculture for their income – although the sector accounts for just one-quarter of GDP. According to the Afghan agriculture ministry, only around 2.5m of 7.5m hectares of arable land in Afghanistan has been cultivated, with the rest unused due to a lack of water management systems. China’s agriculture ministry has begun to support projects designed to find poppy substitutes for Afghan farmers. Four Chinese universities are already at work on the issue, and they have admitted a small number of Afghan students to study the subject. The EU supports Afghanistan’s agricultural and rural development, primarily focusing on sustainable agriculture, natural resources management, and rural households’ dependence on poppy cultivation. EU countries that cooperate with China directly in Afghanistan, such as Germany and the UK, should try to further engage with Beijing by supporting new Afghan agricultural projects. They could develop joint projects in – for instance – poppy substitution or irrigation efficiency. As Germany and China are training Afghans in other areas, they could expand their training efforts to agriculture. Beijing’s reluctance to launch major infrastructure projects in Afghanistan aligns with its growing aversion to financial risk in recent years. Indeed, Chinese leaders increasingly question the feasibility of BRI projects. It appears that they will only reconsider if the security situation in Afghanistan improves. Therefore, just as the UK exchanges views with China on Afghan infrastructure development, other European countries should also encourage Beijing to focus on small-scale, practical infrastructure projects in Afghanistan. If successful, such projects would reflect positively on China, and could be more valuable to local communities than large-scale BRI initiatives. For a war-torn country such as Afghanistan, the BRI fund may be relatively unattractive as it focuses on profit rather than economic stability and sustainable sources of income. The Chinese-led Asian Infrastructure Investment Bank (AIIB), which Afghanistan joined in October 2017, could fund small-scale infrastructure projects in the country. No AIIB member has proposed such a project, but any of them could do so. Although China is the largest stakeholder in the bank, one or more of the AIIB’s 18 EU members should push for projects to improve Afghanistan’s basic infrastructure, such as hospitals, schools, and roads to connect villages with markets. China is in a better position to strengthen Afghanistan’s trade relationships than the EU. Nonetheless, the EU would like to boost trade with Afghanistan – as reflected in the fact that the country benefits from the most favourable trading regime available under the EU’s Generalised Scheme of Preferences, the Everything but Arms arrangement. In theory, Afghanistan has access to the EU’s market; however, in practice, the country has little to sell in the market, and the sides have adopted different food standards. Ever since China established direct rail links with Afghanistan, the countries have had the potential to improve their trading relationship. Although Afghanistan would benefit from greater exchange with China’s vast market, Beijing will remain reluctant to facilitate cross-border trade and other business links between Afghanistan and Xinjiang due to security concerns. However, as the Chinese government aims to strengthen Xinjiang’s economy, it may eventually decide to do so. Beijing could also provide incentives for small and medium-sized Chinese enterprises to develop in Afghanistan, such as low-interest loans. The EU and China largely agree that the US is indispensable to the Afghan peace process. They also agree that the Trump administration’s approach to the Afghan conflict is counterproductive. Although the administration has announced that it will increase the number of US troops in Afghanistan, Beijing and many European capitals have criticised any strategy for the country that relies only on military means, excluding economic assistance or state building initiatives. At the March ECFR conference, Chinese scholars unequivocally condemned Washington’s new south Asia strategy, calling it misguided and dangerous because it neglects the interests of other countries in the region. They have been particularly dismayed at US efforts to achieve a breakthrough in Afghanistan by cornering Pakistan. As a result, Chinese experts have expressed hope that Europeans will convince the US to change its approach to south Asia, especially Pakistan. However, the Chinese may have as little influence in Islamabad as the Europeans appear to have in Washington. EU states should therefore lower their expectations about what China can achieve in the Afghan conflict beyond supporting dialogue formats – especially in relation to whether Beijing can pressure the Taliban into peace talks using its influence in Pakistan. Nonetheless, both China and the EU should encourage dialogue between Pakistan and the US, as this is essential to initiating peace negotiations. In view of the threat it perceives as emanating from Afghanistan, Beijing may believe it had little choice but to boost its security investment in the country. Given its increasingly cautious attitude towards investment more broadly and the growing number of global security challenges it faces, China may also strengthen its security commitments in other countries in crisis. According to one Chinese scholar, China is doing just that. Meanwhile, Europeans should capitalise on the shift in China’s priorities towards the containment of security threats. Cooperation between the EU and China on security issues seems unlikely at this stage due to the major differences in their approaches. Beijing would probably resist Europeans’ push to strengthen state capacity by combining security efforts with development and economic assistance, as well as anti-corruption measures. However, European countries such as France, Germany, and the UK could use their existing security dialogues with China to better understand evolving Chinese attitudes towards security. Simultaneously, Europeans should question the substance behind China’s rhetoric and work to ensure that, true to its word, the country plays “a bigger and more constructive role in upholding world stability”. As part of this, the EU should ask Beijing to clarify the conditions attached to BRI infrastructure projects, and insist on transparency in their implementation. European countries should also establish contact with China’s new development agency, exploring options for China to provide development assistance in areas such as agriculture. Finally, Europeans should learn from countries other than Afghanistan in which China appears to be shifting its focus away from development and towards security. By doing so, they would gain a deeper understanding of China’s overall approach to development and security, helping them determine whether China is undergoing a profound long-term shift. Given that European states may either cooperate or compete with China’s expansion of its influence from Asia to Africa, their capacity to engage with the rest of the world will to some extent depend on an understanding of Chinese ambitions to provide development and security. The apparent shift in China’s approach may provide Europeans with a new perspective on the BRI, perhaps vindicating those who are wary of the project and its official narrative. Angela Stanzel is a senior policy fellow in ECFR’s Asia & China Programme, as well as the editor of China Analysis. Alongside China’s foreign policy and EU-China relations, her research focuses on south Asia in the context of China’s rise. She is author of a range of publications and often features as a commentator in the international media. Chinese experts’ comments during an ECFR policy conference at the China Institutes of Contemporary International Relations, Beijing, 23 March 2018. Interviews with a professor of international studies at Peking University, Beijing, December 2017. EU representative’s comments during an ECFR roundtable discussion at the Shanghai Institute for International Studies, Shanghai, 19 March 2018.